There are so many benefits for creative and imaginative play from improving problem solving and cognitive skills, to boosting self-expression and critical thinking. But don’t limit creative play toy box to just arts and crafts. Toys are amazing for a child's imagination and encourage role play are just as good for creative development as a set of paints. And while there are plenty of creative toys out there, some lose their novelty value quickly. 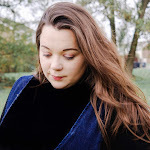 The best way for my daughter to unleash her creative imagination is with model figures, as these are something that she goes back to time and time again. That's why we love Schleich toys, not only do they look like real animals but they are sturdy and built to last too. 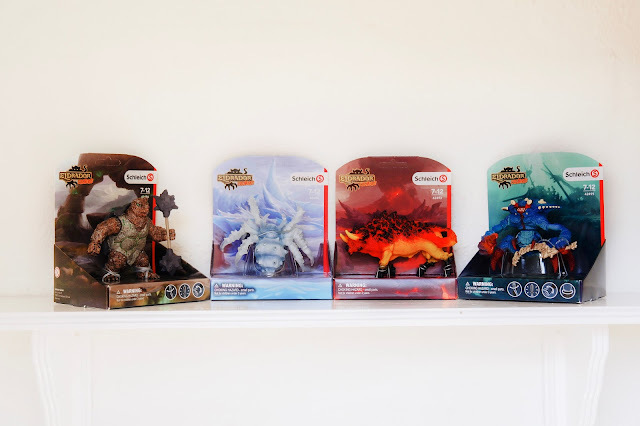 Schleich already have an impressive collection such as Farm Life, Horse Club, Dinosaurs and even Elves and Fairies fairytale figures from Bayala range. As well as individual Schleich animal figures, you can also find play sets, starter sets and new products from the Smurfs™ and DC Comics™ and ranges. We were lucky enough to be introduced to the four worlds of Eldrador®; a place where only one thing counts - the super weapon! No matter which world they come from lava, ice, stone or water all the creatures want to get hold of the super weapon. 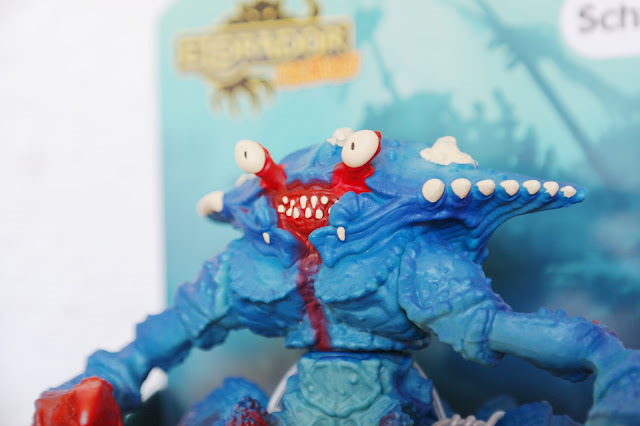 There are currently sixteen Eldrador Creatures to collect including a couple of different play sets. The Eldrador range, is aimed at older children of 7+ and now there are four new characters to add to the already impressive collection. The Armoured Turtle, Ice Spider, Fire Bull and Battle Crab. My daughter really like the look of the Armoured Turtle as he came with his own weapon. With everything we like to give toys names and so we had to give the fella a name and we named our new friend Rock as he is from the Stone world of Eldrador. However, don't be deceived in thinking that this armoured turtle is old or slow because he is a master of deception. Without warning, the armoured turtle will launch its devastating counterattack: spinning around lightning-fast and swinging its massive double-headed club at its enemies with incredible force. The turtle itself is pretty chunky and heavy so I know that this would be pretty robust whilst my daughter and nephew were playing battles with one another. I also like the fact that this turtle had arms that you were able to move and change his weapon in an instant. Our next Eladrador creature is this deadly Ice Spider who was aptly named Frozen. Now this is one spider you don't want to meet, as one bite from the spider is enough to put opponents on ice for a very long time. However if the ice spider ever finds itself surrounded it always keeps a cool head and with the help of her eight eyes she can keep an eye on several opponents at the same time and fend them off. 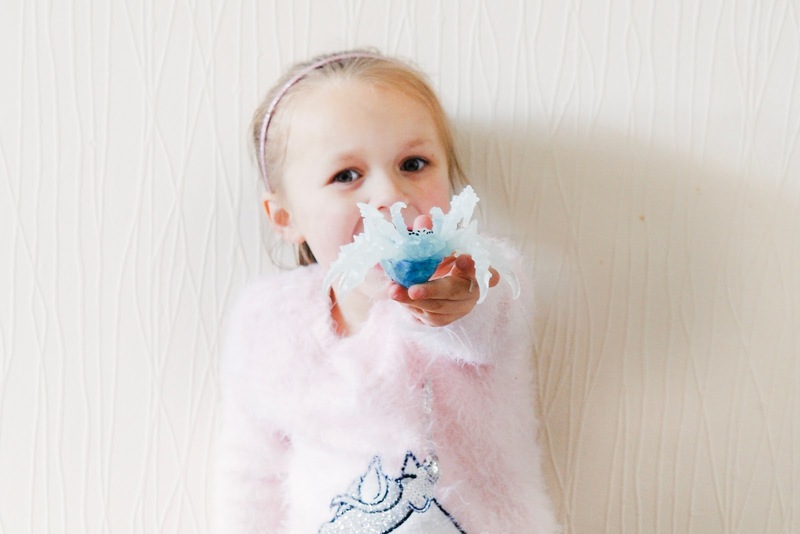 I believe that this ice spider was my daughter's favourite, I have a sneaky suspicion this has something to do with Charlotte's Web, but she loved creating a little adventure for her new friend Frozen. So much so that she made her friend a house so she could rest and be ready to tackle any enemy that may get in her way in her quest for the super weapon. This Ice Spider felt a little different to the normal toys made my Schleich, this one had more of a rubber feel to it. I don't feel that this one would be as robust as some of the others in the range, as my daughter was playing we started to notice that some of the paint started to peel away or rub off which is a shame. But this didn't stop my daughter from having fun with her new friend. From the Lava world we had the Fire Bull and my daughter named him Frankie! Yep, I don't know either, but still Frankie the Fire Bull doesn't stick around too long. 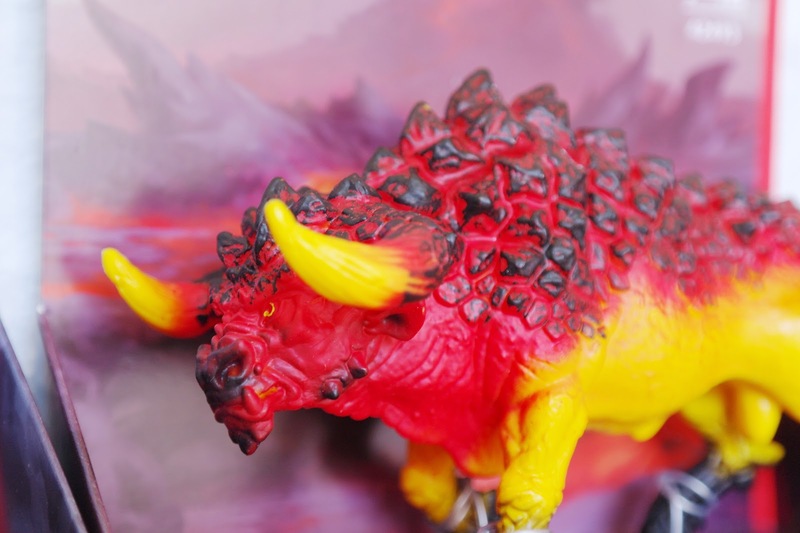 The fire bull doesn’t think twice before skewering opponents with his pointy, glowing-hot horns, which can pierce even the strongest of Armour. But even if they manage to dodge the horns they shouldn't be too happy as the fire bull has a second trick up his sleeve with his flaming tail. One swipe from this can completely annihilate an opponent. The fire bull certainly packs a punch with his horns and tail but enjoys an ice lolly or two to keep cool. This one is similar to the Armoured Turtle in terms of size and robust enough for little people and their action play. Lastly, we have the Battle Crab who comes with his own weapon. Any opponent would find it hard to escape this fighting crab with his weapon. I also think that the fact that this has a completely turnable upper body is pretty cool. Now with his six legs he is able to get around fact and even catch up with some of the fastest opponents. 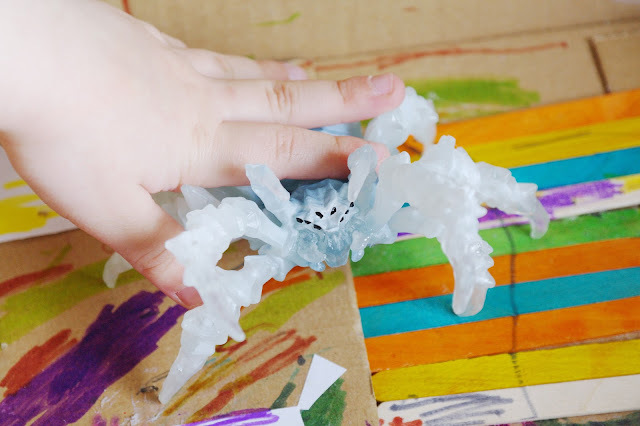 My daughter wasn't too fond of the Battle Crab as he looked a little scary, however my Nephew was more than happy to take the Battle Crab off my daughter's hands to head into battle against the Armoured Turtle. My only worry with this one is with the upper body at times it can catch and take some time to twist around, but it's probably going to take some time to wear in or something. 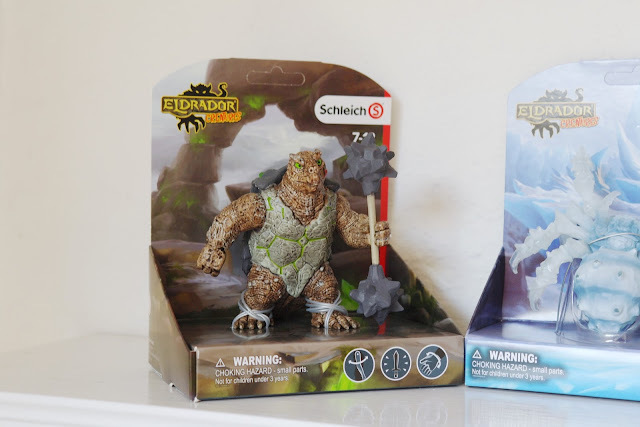 Each of the Schleich Eldrador Creatures are totally different with unique features, these additions to the already impressive collection will slot into Eldrador play very well. And even though that my daughter wasn't too keen on the Battle Crab and thought he was a little scary, she's younger than the recommended age of 7 years and up. However, she loved playing with the other three with her cousin. 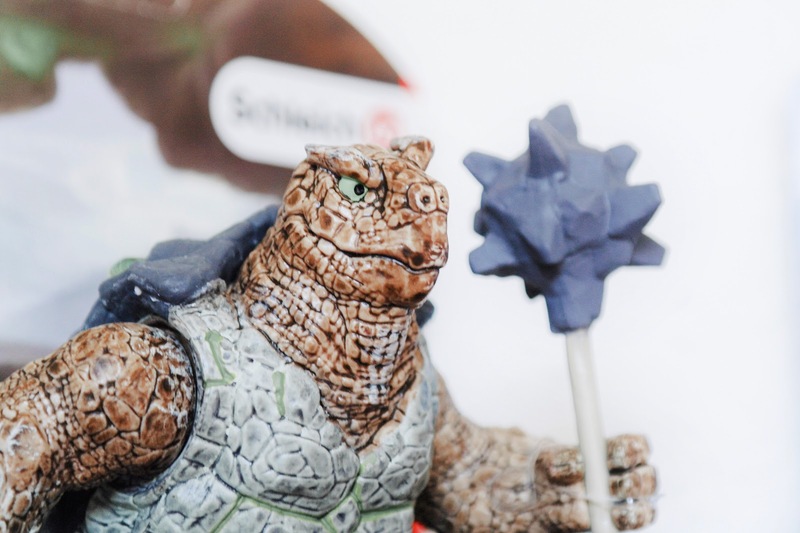 If you wanted to go and see what Eldrador and all the toys available to help battle it out to get to the super weapon then head over to the Schleich website to see what's on offer. We were kindly gifted a bundle from Smyth Toys for the purpose of this review. But as always my words and images are my own. 10 comments on "Schleich Play with Eldrador® Creatures"
My daughters had some of the fairy and swan Schleich toys when they were younger. I was drawn to them myself in the shops, they are pretty cool. These look full of myth and magic! Schleich are a great brand, brilliant quality, we have lots of their toy animals. Ooo an ice spider! I love how unusual these characters are. My girls would love this! My littlest grandson would love these as he plays with his Skylanders and Dinosaurs for hours, they're great for igniting the imagination. I've not seen this toy range before, I like that they are something a little bit different. My daughter would love to play with these too and would be great for both boys and girls. These look so cool, imaginative and detailed! Great for the little ones! Our First Easter Egg Hunt. Are You Thinking About Buying a New Car?